May and June have been very exciting months for me. 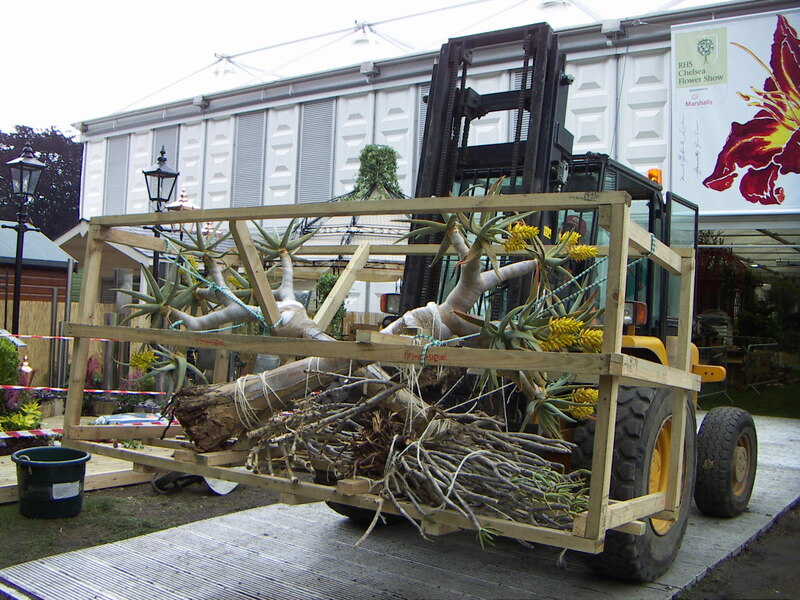 In the middle of May I was able to work with the Kirstenbosch team at the Chelsea Flower Show. It was an amazing experience! Seeing the stand start off as a fairly open space with just the reservoir wall across the centre and some rusty barbed wire and a rusty gate, and then seeing it develop into a medal winning display was wonderful. 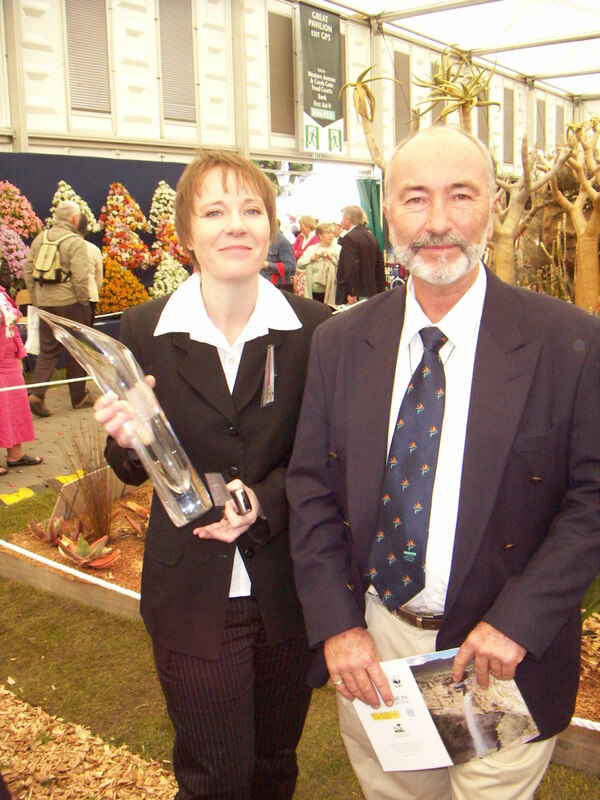 The designers for the Chelsea exhibit were David Davidson and Raymond Hudson. They really did us proud and produced an amazing display which won a Gold Medal as well as ‘The President’s award for the Most Creative Display’. It was wonderful for them as well as being great for the sponsors. First National Bank is the major sponsor and deserves a really big ‘Thank You’ from us all in the Western Cape as being at Chelsea really is exceptional exposure for Cape Town inparticular as well as the rest of South Africa. Brett from FNB in Johannesburg was also there during the build up getting his hands dirty – real involvement by the sponsors is so good to experience. The flowers, aloes, Quiver Trees etc. 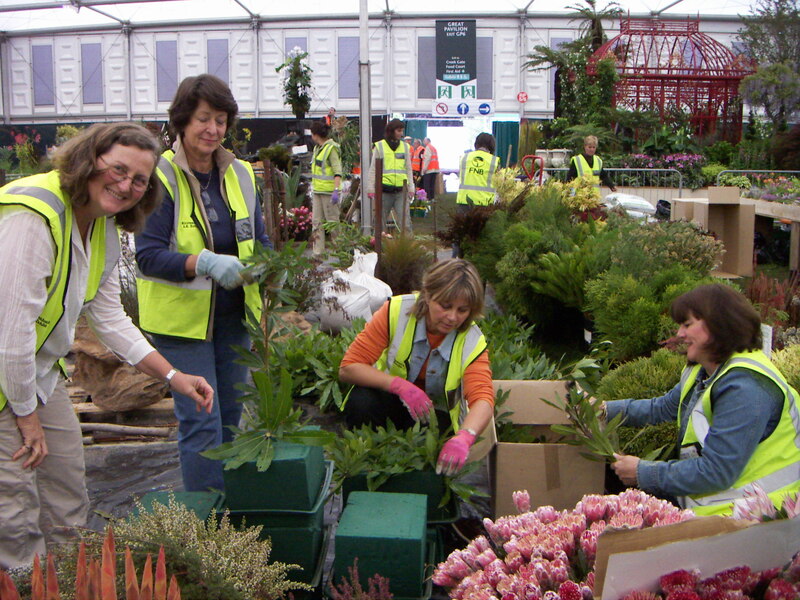 all arrived on the Thursday before the show started, so from then on it was all systems go – re-cutting stems, putting into buckets of water etc. 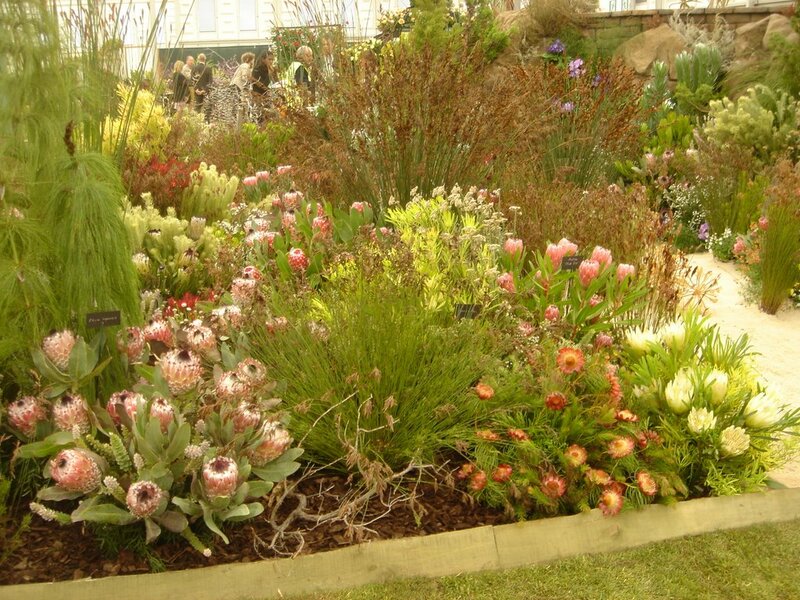 The whole stand was surrounded by fynbos! Slowly things started taking shape. I must confess at one stage I did wonder how we were ever going to finish, but David and Raymond are old hands and they didn’t seem to worry, and of course everything was finished by the Sunday night. They however received a phonecall at 5.30 on Monday morning to say a pipe had burst next to the stand and some damage had resulted. They called everyone staying at their hotel and by the time I got there at 10.00am all was looking perfect! Monday was the day for The Press, Dignitaries, judging and the Royal visit. The security squad went through the whole area with sniffer dogs that seemed to be loving their job. The results were delivered on Tuesday morning amidst great excitement. 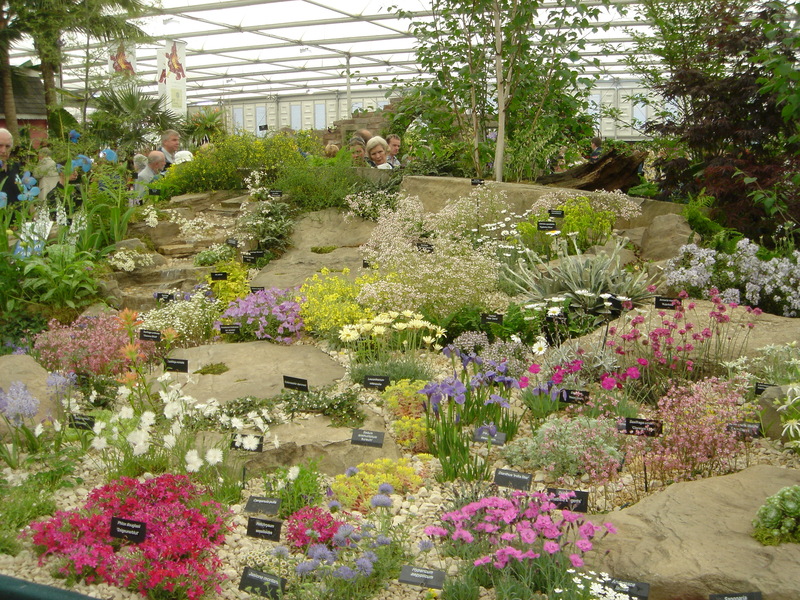 The Alpine Society stand next to ours won ‘The Presidents Award for the most Outstanding Display’. Watching them at work was fascinating. Many of the plants used are dainty and delicate looking, and were planted out with the utmost care using the smallest of garden equipment. A well deserved win. 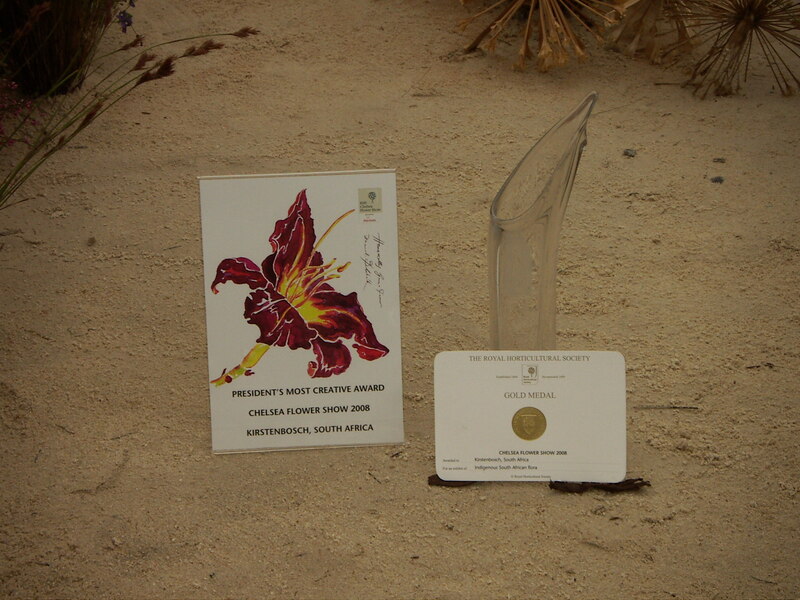 Recipient of The RHS Presidents Award for The Most Outstanding Exhibit. 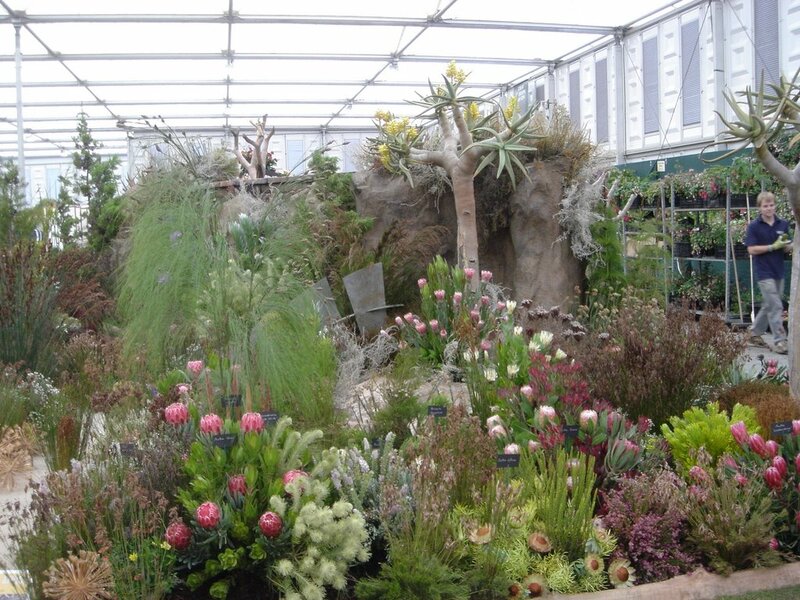 During the show I did a stint on the stand and saw our fynbos through the eyes of non-South Africans for the first time. We have it on our doorstep all the time and as so often happens you take things around you so for granted. I certainly gained a new appreciation for our beautiful fynbos. There were a number of South Africans living and/or working in London who just wanted to smell the ‘veld’. my photographs of the Kirstenbosch Exhibit. Chelsea for me was a very special experience. I stayed with my daughter, Helen, in London and had a few days to recharge my batteries before flying to Denver to visit my son,Malcolm and his wife, Jill. Helen works across the road from Regent’s Park so we shared a picnic lunch there on a few occasions. The gardens there are so beautiful and so well looked after. It is wonderful being able to wander in it, sit on the grass and have a picnic, or a snooze if you so wish. The Rose Garden itself just takes your breath away.